I mentioned this this time last year, but I used to make a lot of datagraphics about GDP growth. The format here has not changed and so there is nothing new to look at there. But, the content is still interesting. And the accompanying Economist article makes the point that high growth rates are not always what they seem. After all, Syria’s high growth rate is because its base is so small. Late last week I was explaining to someone in the pub why the World Cup matches are played beyond their 90 minute booking. For those among you that do not know, basically the referees add up all the stoppage time, i.e. when play stops for things like injuries or people dilly dallying, and then tack that on to the end of the match. 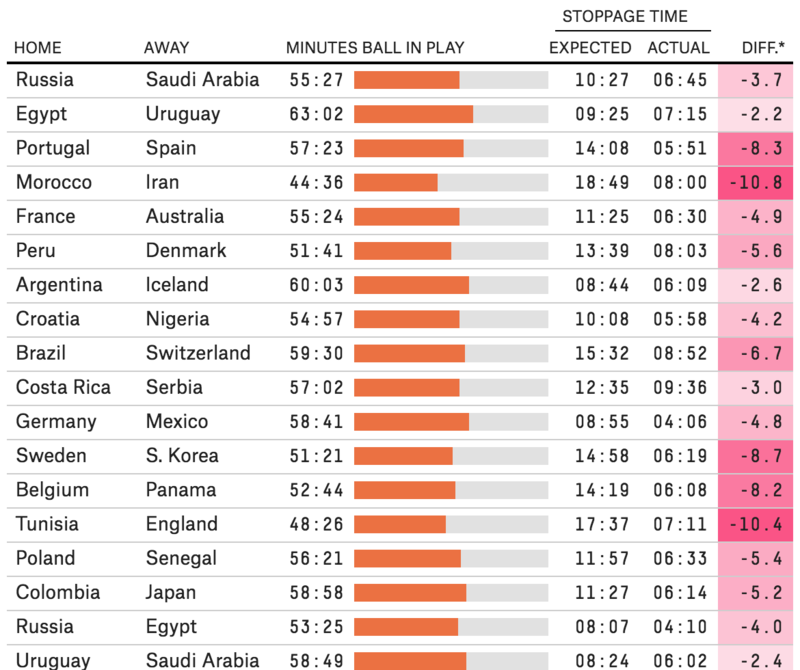 But it turns out that after I explained this, FiveThirtyEight published an article exploring just how accurate this stoppage time was compared to the amount of stopped time. Spoiler: not very. The setup is straightforward: a table organises the data for every match. The little spark chart in the centre of the table is a nice touch that shows how much of the 90 minutes the ball was actually in play. The right side of the table might be a bit too crowded, and I probably would have given a bit more space particularly between the expected and actual stoppage times. On the whole, however, the table does its job in organising the data very well. Credit for the piece goes to David Bunnell. 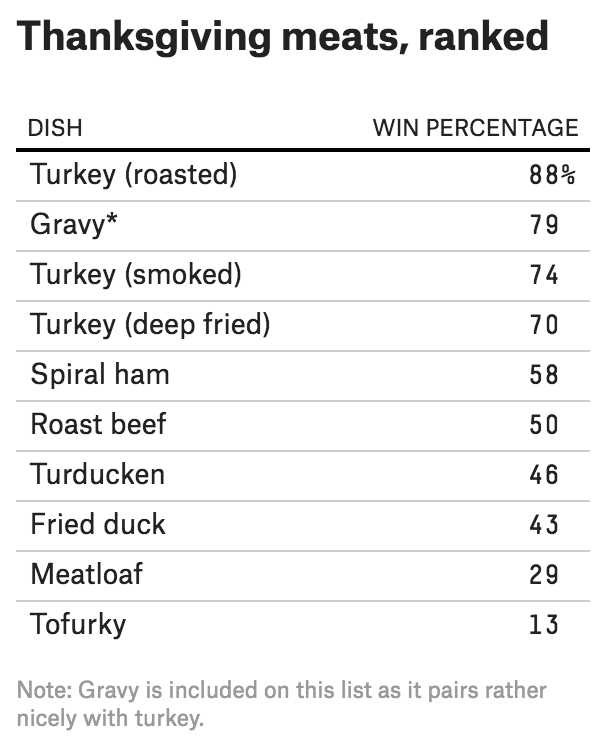 Just a neat little piece today from FiveThirtyEight. They take a look at the potential impact of the Trump administration’s proposed tariffs on the farm vote in the United States. 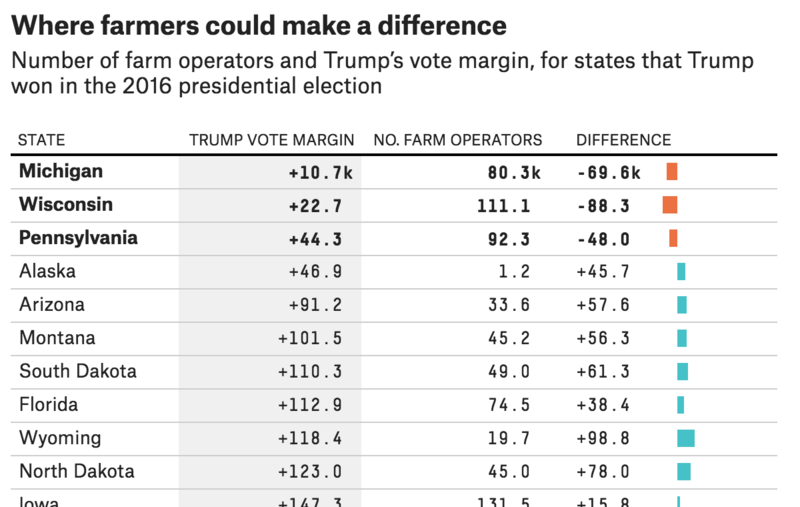 The screenshot of the table shows how the farm population compares to Trump’s margin of victory in 2016. The three states at the top? The very same Pennsylvania, Wisconsin, and Michigan about which we hear so often. Yes, Pennsylvania does have large cities like Philadelphia and Pittsburgh, but agriculture is an important part of its economy. So if the tariffs or the reprisals to the tariffs have any significant impact on the livelihood of farmers, that could be enough, all things being equal, to flip those states. About the design, I think the inclusion of the mini-bar chart helps tremendously. Tables are great for organising information, but scanning over and through cell after cell of black text can hide patterns. The visualisation of those patterns at the end of each row helps the user tremendously, by making it very clear why those three states were highlighted. Credit for the piece goes to Rebecca Shimoni Stoil. Yesterday was murders in London and New York. 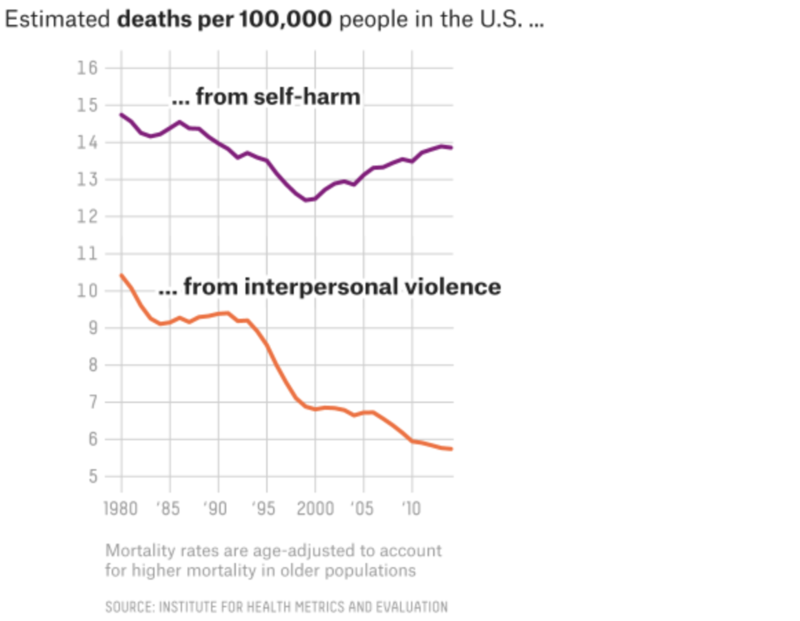 Today, we have a nice article from FiveThirtyEight about deaths more broadly in America. If you recall, my point yesterday was that not all graphics need to be full column width. And this article takes that approach—some graphics are full width whereas others are not. This screenshot shows a nice line chart that, while the graphic sits in the full column, the actual chart is only about half the width of the graphic. I think the only thing that does not sit well with me is the alignment of the chart below the header. I probably would align the two as it creates an odd spacing to the left of the chart. But I applaud the restraint from making the line charts full width, as it would mask the vertical change in the data set. The screenshot is of the graphic’s full width, note the lines only go a little over half the width. 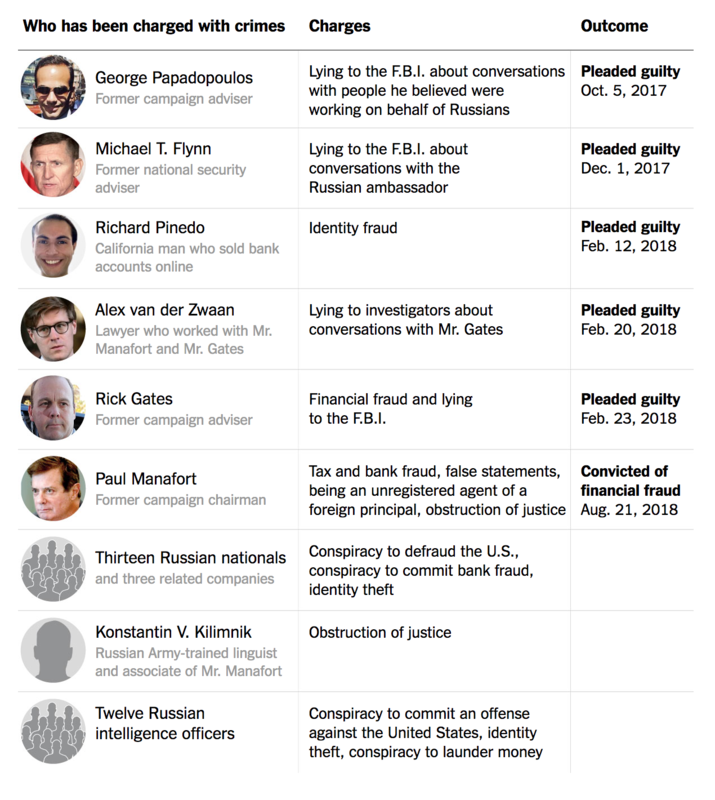 Meanwhile, the article’s maps all sit in the full column. But my favourite graphic of the whole set sits at the very end of the piece. 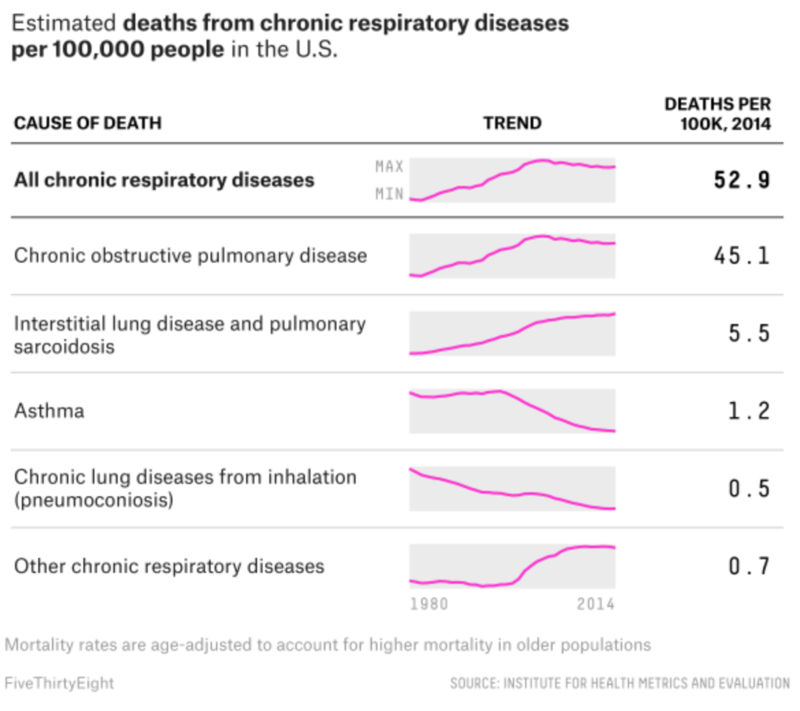 It examines respiratory deaths in a tabular format. But it makes a fantastic use of sparklines to show the trend leading towards the final number in the row. Credit for the piece goes to Ella Koeze and Anna Maria Barry-Jester. The above is the screenshot for the American League East, because Boston. But, the rest of the AL is on that page as well. For those of you from my more National League-following cities like Philadelphia and Chicago, FiveThirtyEight also previewed the NL divisions here. Credit for the piece goes to Neil Paine. Yesterday we looked at the new congressional district map here in Pennsylvania, drawn up by the state supreme court after the Republican legislature and Democratic governor could not come to agreement. 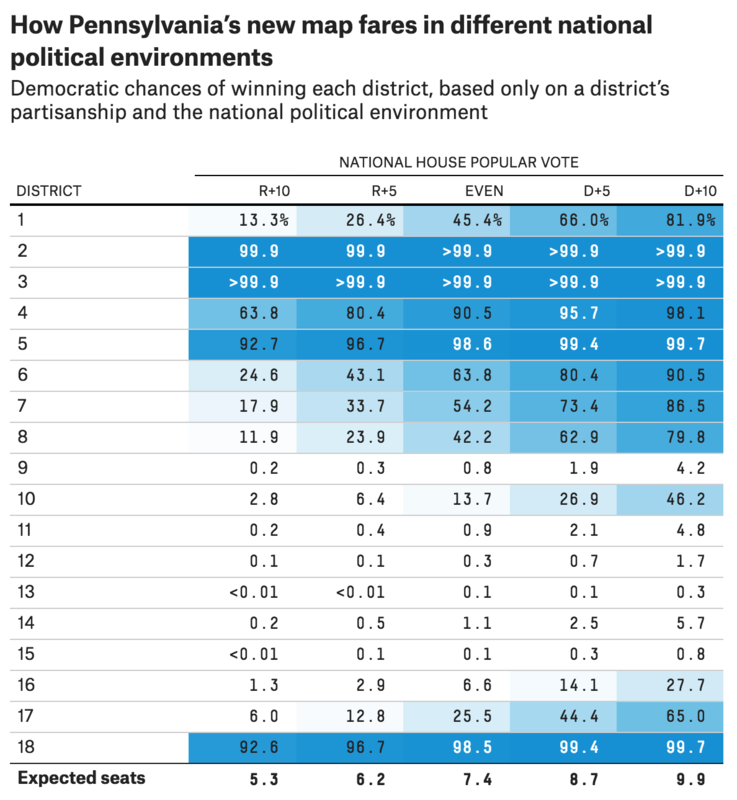 Also yesterday, FiveThirtyEight explored the redrawn map in more detail to see if, as I’ve read in a few places, the new map is a Democratic gerrymander. In short, no. The article does a great job explaining how, basically, it might seem like it because more Democrats are predicted to be elected based on various models. But, that is only because the map was so extremely gerrymandered in the past that any effort to increase competitiveness or fairness would make Republicans more likely to lose seats. This one table in particular does a nice job showing just how in an average election cycle there are only four seats that you could consider reliably Democratic whereas there are six that are reliably Republican. And keep in mind that Pennsylvania actually exhibits the reverse split—there are more Democrats than Republicans in the state. So even with this new map, the state exhibits a slight Republican bias. Credit for the piece goes to Aaron Bycoffe. January is the month of forecasts and projections for the year to come. And the Economist is no different. 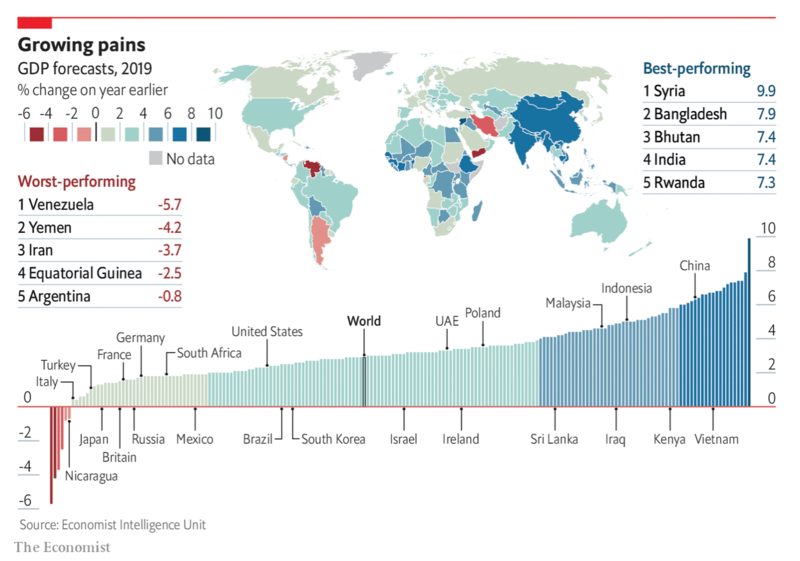 Late last week it published a datagraphic showcasing the GDP growth forecasts of the Economist Intelligence Unit. I used to make this exact type of datagraphic a lot. And I mean a lot. But what I really enjoy is how successfully this piece integrates the map, the bar chart, and the tables to round out the story. The easy thing to do is always the map, because people like maps. They can be big, and if the data set is robust, full of data and colour. But maps hide and obscure geographically small countries. And then you have to assume that people know all the countries in the world. Problem is, most people do not. 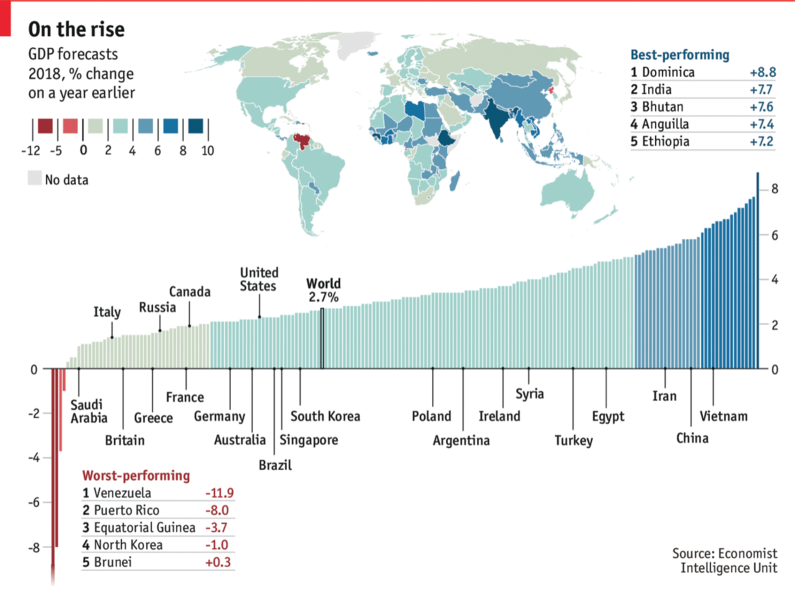 So the bar chart does a good job of showing each country as equals, a slim vertical bar. In such a small space, labelling every country is impossible, but the designers chose a select number of countries that might be of interest and called them out across the entire series. Lastly, people always like to know who is #winning and who is a #loser. So the tables at the extreme ends of the chart showcast the top and last five. I may have rearranged some of the elements, and dropped the heavy black rules between the bins on the legend, but overall I consider this piece a success.